I was in the middle of researching William Bradford, and reading Rudy’s essay on Bradford’s frames when I got an email informing me that he had passed away. Worse than that, I had just started making headway on This Side of Paradise, a book set largely at Rudy’s alma mater — I was preparing an email to him to ask him how much of it was true (though he clearly graduated a few decades later). I haven’t experienced very many deaths in my life yet, but this one hit me hard. I had to put down my work and sit for a long while. I was intending to visit him this coming August. Rudolf Meyer Riefstahl II, 82, of Rochester, Massachusetts, died unexpectedly on June 25, 2011. Born in Istanbul, Turkey, the son of Rudolf Meyer-Riefstahl and Elizabeth Titzel Riefstahl, Rudy was raised in New York City, where he attended the Brooklyn Friends School. He was a graduate of The Hill School, and Princeton University. After serving in the United States Army in Germany during the Korean War he pursued graduate studies in art history at the Institute of Fine Arts of New York University. He was employed by the Fogg Art Museum of Harvard University and The Toledo Museum of Art before working in private practice in conservation of works of art and curatorial services in Michigan for many years. After moving to Massachusetts he found new outlets for his love of art, history, classical and choral music and reading. He found community through his many years of volunteering in the conservation department of the New Bedford Whaling Museum, and through singing with various local choral groups; the Sippican Choral Society, Sine Nomine, and, most recently, Mastersingers by the Sea. An avid reader until his death, Rudy could often be found enjoying the Rochester library, or perusing yard sales on Saturday mornings, from which he often brought home trinkets for his granddaughters, books or old tools to add to his collection. Rudy was married to Deborah Lockwood Riefstahl, who died in 1989. He is survived by his son, Rudolf Meyer Riefstahl III of Grayling, Michigan, his daughter, Sophia Arnfield of Rochester, and three granddaughters; Deborah E. Riefstahl, Albertine A. Arnfield and Beatrice C. Arnfield. Burial and private ceremony will be held at a later date at Oakwood Cemetery in Traverse City, Michigan. Donations in his memory may be made in support of the conservation department of the New Bedford Whaling Museum, the Friends of Rochester Plumb Library, or to Mastersingers by the Sea of Falmouth, Massachusetts. 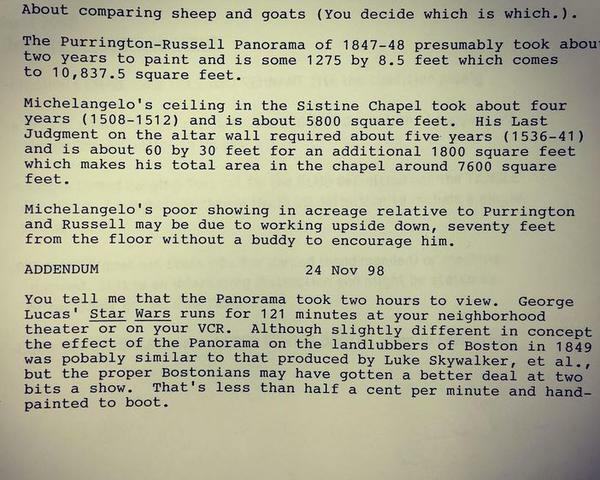 Here’s a little note from him in the NBWM archive that we found recently re: the colossal Russell-Purrington panorama.